Go stronger, longer. Stretchier. Stickier. Superior. Made for competition, ROCKTAPE is the only kinesiology tape engineered to meet the demands of endurance athletes like runners, swimmers and cyclyists. 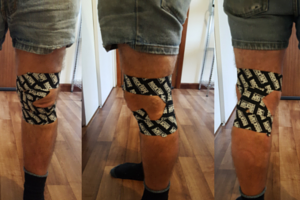 Unlike other products, ROCKTAPE can be used both to apply compression to promote recovery, or decompression to relieve pain and swelling. EACH ROLL COMES WITH A DETAILED INSTRUCTION MANUAL FOR STRAIGHT-FORWARD INJURIES. Available in the clinic and to order.